Mariah Carey is the best-selling female artist of all time with more than 200 million albums sold to date and eighteen Billboard Hot 100 #1 singles (seventeen self-penned), more than any solo artist in history. The superstar is synonymous with Christmas thanks to her self-penned and produced #1 timeless classic, "All I Want For Christmas Is You." The evergreen holiday smash hit, which she wrote and produced early in her career, is the annual bestselling holiday single, hitting #1 on Billboard's Holiday Digital Songs, Holiday Hot 100 and Holiday Streaming Songs charts. Mariah's holiday opus, "Merry Christmas" is the perennial bestselling global holiday album, having sold over 14 million copies worldwide to date. And now, for the first time ever, NBCUniversal has unprecedented access into the icon's yuletide festivities. Last week, Carey opened and closed NBC's Christmas in Rockefeller Center Treelighting special which garnered the highest ratings in seven years. Following the highly rated performances, Carey officially kicked off her "12 Days of Christmas" live from her chic Tribeca triplex in New York City on the Today Show on Wednesday, December 11 at 8am. 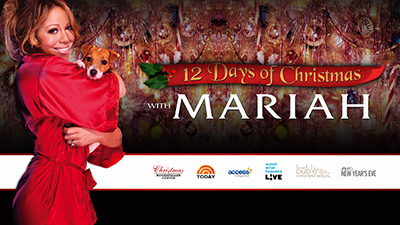 Mariah will make appearances on all three hours of the Today Show across numerous days and will also spread holiday love and cheer with appearances on Access Hollywood, Extra, Bravo's Watch What Happens Live, Al Sharpton's PoliticsNation on MSNBC, and more. The superstar will share Yuletide cocktail recipes, spend time with the Fresh Air Fund children, and for the first time, allow cameras exclusive access into her home decorated for the holiday. Carey is confirmed to headline NBC's 2013 New Year's Eve broadcast with special performances you won't want to miss! The ordained "Queen of Christmas" will also grace the stage with Michael Buble for his special airing December 18th. For a complete list of dates and up-to-the-minute information please go to mariahcarey.com and @mariahcarey on Twitter.